In 1993, historian A.J. Turner remarked that “[a]though studying instruments as part of science is an old pursuit, writing the history of scientific instruments is new.” Writing on the history of medical instruments is even newer, for since the 1990s, there has been a remarkable explosion of scholarship on the history of medical instrumentation. But what exactly is medical instrumentation? As the standard on the general history of medical technology, Stanley J. Reiser’s 1978 Medicine and the Reign of Technology provides a seminal study on the history of early diagnostic instruments, as they were understood by medical practitioners from the seventeenth century, to modern computation instruments. In addition to outlining factors that influence cultural development–including philosophy and religion, economic and political systems, and social and cultural values–Reiser expresses his concern on how the growing supremacy of technology has led to the increasing alienation between physician and patient. For Reiser, this is one of the most serious consequences of technology in medicine, and he focuses his evaluation of the use of instruments to examine how the construction and design of an instrument can increase the alienation. In her 1981 Medicine and its Technology: An Introduction to the History of Medical Instrumentation, Audrey Davis shifts away from the strictly physician-patient perspective of instruments and examines how social attitudes determined the acceptance and shaping of modifications essential for evolving the design and use of instruments. To Davis, technology becomes just another element in the social, political, and economic design of medicine, just as ideas of disease, professionalization, and institutions have shaped the use of instruments in practice. By the late 1990s, scholars studying the history of medical technology generally accepted Davis’ claim that making instruments the subject of historical analysis largely depends on evaluating the acceptance and use of those instruments within prevailing conditions and the social and cultural factors that impinge on the technology. The bottom line? Much historical relevance can be retrieved from a closer examination of an instrument beyond its life history, and further, the instrument itself can provide analytical evidence for the social contexts surrounding its historical period. John Pickstone, for instance, argues that innovative trends in medicine may reside and reveal economic patterns of growth, supply and demand. The development and use of an instrument can in part, be justified by economic rationality, especially as medicine was a very peculiar market. The cost of building instruments for diagnosis would have affected a practitioner’s decision to use an instrument in his practice; of course, at the same time, its positive reception would have benefited the practitioner’s practice. With these views in mind, two Augusts ago I visited the Deafness in Disguise exhibit at the Becker Medical Library at Washington University School of Medicine in St. Louis. I had just started thinking about my PhD project and was looking for some sense of direction; while researching for my paper on John Harrison Curtis for my Fundamentals on the History of Medicine class, I came across the website, which contained an image and description of one of Curtis’ acoustic chairs. Searching through the site, I became enamored with the various instruments and devices used in the seventeenth to early twentieth centuries to aid and disguise hearing loss. 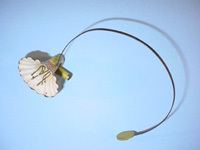 Having worn hearing aids most of my life, I also became curious about how individuals designed, chose, and wore these (sometimes funny-looking) instruments. Thus, the first research trip of my PhD career (and research grant–thanks, IHPST!) was to St. Louis to examine the instruments in person. Like many collections I’ve come across later, many of the glorious artifacts were not out on display, but rather boxed and stored away. Nevertheless, I managed to examine some of the most interesting artifacts and began to think about the connections between these artifacts and my ideas on the social construction of deafness in relation to medicine during the early nineteenth century. digitized on the exhibit’s website, easily accessible by keyword search. I saw the gorgeous Floral Aurolese headband (right), which was made by a F.C. Rein around 1802. The phone still shows its original colors and apparently provided a solid acoustic benefit to its wearer (up to 10dB over limited frequency range). Over 200 years old, this device still shows its original white and green paint. Despite its fragile appearance and small size, the Aurolese Phone provided an acoustic benefit up to 10 dB over a limited frequency range and was appropriate for a person with a mild hearing loss. This was one of my favorite artifacts, and coming from a background in fashion, I couldn’t help but imagine how the fancy bouffant hairdos commonplace at the period could have perfectly hidden the band and ear insert, leaving just the beautiful flower exposed. Of course, this particular hearing artifact would have most likely appealed only to the rich and aristocratic. I have so much to say about many wonderful artifacts in this collection, but I think this post is becoming far too long. I’ll reserve a post on how my observations of the collection, combined with my lessons from the Reading Artifacts workshop, shaped my thoughts on deafness and Foucault’s (overused?) concept of technologies of normalization. For now, thank you Dear Reader, for putting up with a very long post!